Tanzania is undoubtedly one of the most beautiful and magical locations across the world, not just in Africa. Not only does it boast the highest peak in the whole of the continent, but it is also home to the incredible wildebeest migration, and the relaxing and luxurious island of Zanzibar is a short trip away. It is a destination that has it all, and if you are planning on visiting Tanzania in the future, read on to discover what you need to know before your trip. Bring comfortable walking shoes – When packing your holiday suitcase, it is very tempting to pack it full with your glitzy sandals and flip-flops, but make sure you put in a comfortable pair of trainers or walking shoes as well. 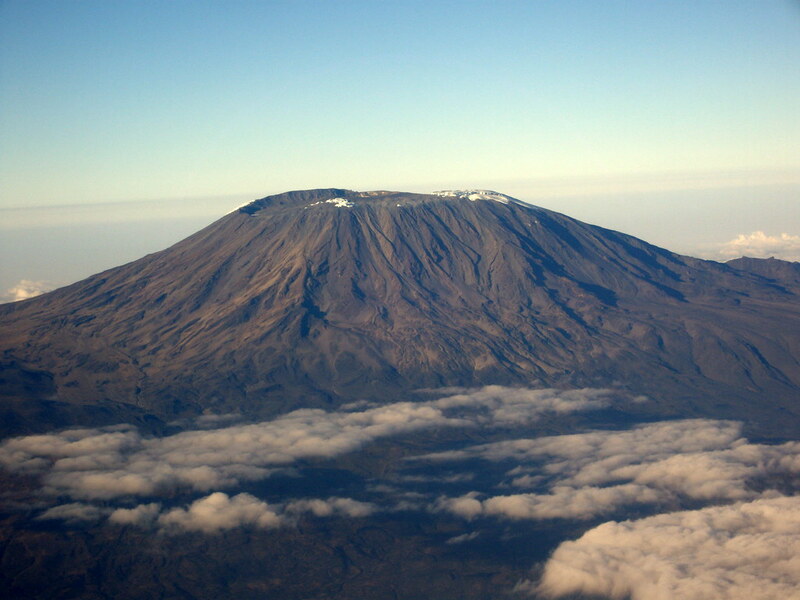 After, climbing Mount Kilimanjaro is no easy feat, and if you are visiting this part of Africa, taking one of the routes on this dormant volcano is a must. For more information on planning your climb, head to AlienAdv.com. They have plenty of details on the different routes available, and can help you to determine the best approach for you. Planning in advance is a must. Travel can be cheap – You can head all of the way to central Zambia on the TAZARA train, and it is really affordable. However, do make sure you book in advance, as it is often full for weeks at a time. The people are great – There may be many amazing sites and things to do in Africa, as you will discover here – PlanetWare.com, but one of the best things about the area is that the people are amazing. The country has more than 100 ethnic groups, and it is advisable to get involved with the culture. Join in with their fun conversations, try their delicious food, and learn their cultural practices. Make sure you have a Visa – In Tanzania, most foreign nationals will require a visa, no matter whether you are visiting to conduct business or you are going on a vacation. There are some foreign nationals that are permitted to travel visa-free for up to three months, but these are mainly Asian and African nationals. Make sure you find out what visa you need and get it sorted way in advance of your trip. Roads get bumpy – One thing you need to be prepared for is a bumpy read when in Tanzania. There will be wandering animals, places that aren’t paved, weird grooves, and potholes, and so, as you can imagine, this does not make for the best driving conditions. Your health is vital – You do need to take some health precautions before you visit Tanzania. This is because it is a tropical environment, which means it favors the growth of various fauna, flora, and bacteria, and most visitors are not used to this. So, while you are there, make sure you only drink bottled water while you are in Tanzania, and visit your doctor to get tablets before you visit to protect your from malaria. Your accommodation will have mosquito nets fixed to your beds, and mosquito repellents are sprayed in each room too, but it is better to be safe than sorry. When choosing your next travel destination, there’s a few essentials that you have to keep in mind that influence your choice of location. Firstly, there’s your budget – which is always going to constrain what you might want to do. Secondly, you have to decide if you want to return to a much-loved existing destination, or if you want to try something different. Then there are other considerations such as the time you have available or who you might like to go with – but one thing has a tendency to be forgotten: the things you love when you’re at home. The chances are, you’d consider yourself an animal lover. Most of us do, excusing the odd phobia and bad past experience. This love tends to manifest itself in the love we bestow upon our pets, but this is something we leave behind when we set off on our travels – the animal lover side of our personality stays firmly at home. What if it didn’t have to, though? What if you could add another consideration to that long list of concerns – a consideration to find a place that allows you to see and experience animals in a totally different country? Swimming with dolphins tends to appear high on many bucket lists, especially for those of us who consider ourselves animal lovers. The beauty of this goal is that it’s so attainable. From aquatic centers in Europe to the natural waters of Australia; swimming with dolphins is something you can incorporate into almost any holiday. However, it’s perhaps best experienced on coastal resorts in warm countries. Think the Caribbean over the landlocked European countries; aqua parks where the dolphins are kept in as natural a habitat as possible. The Dominican Republic and Jamaica both come highly recommended, so perhaps start your search there. If you don’t just want to experience different animals but actively help them, then offering your help with conservation projects can be a wonderful way of combining travel and your love of animals. You can largely choose any animal that you might wish to assist, with Africa being a prime destination to consider, especially if you’re considering working with elephants or any of the other famed “big five” animals. Namibia and Botswana should be at the top of your list as places to research. Finally, the above two options are wonderful in their own ways. However, they do somewhat separate animals from humans in how the interaction with the animals goes about. If you prefer the idea of a less forced separation, then the island of Gibraltar might be what you need. The famous local monkeys – Barbary apes, to be specific, but everyone refers to them as monkeys! – are a part of the local tradition and integrate with humanity in ways rarely seen anywhere else in the world. Tourists to the rock are nothing new to these animals, who have grown up seeing humans as a source of easy food and a nice fuss rather than anything to be feared. Gibraltar – a British overseas territory – is nice in and of itself, with a temperate climate and stunning views over the Atlantic Ocean. Marrakech has to be one of the most breathtaking and astonishing cities in the whole world. It’s a riot of color, culture, music and life. The architecture is authentic even today, the squares and streets and bustling and busy. There is manmade nature to rival the peace and serenity of the natural beauty found high above in the cities mountains. It is the ideal place to spend a long weekend, a week or a fortnight. It balances chaos with calm, demure with boldness. Read on for an insight into the incredible place, and four things you must find time to experience while you are there. First things first; staying in a beautiful villa or riad should be an absolute priority for your visit. If there is one thing that the Moroccans are truly excellent at, it is building and decorating their homes. You’ll quickly see that luxury in Morocco isn’t hard to find. 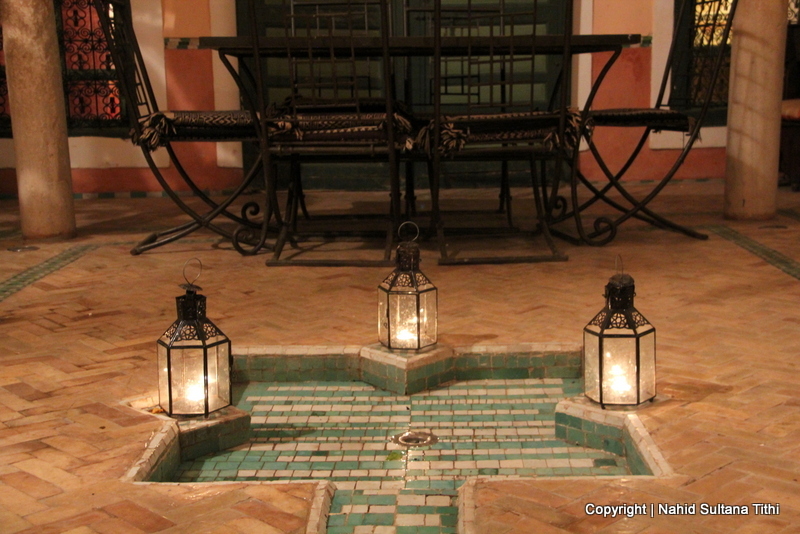 If you want to be bang in the center of things, look for a luxury riad with a central location. If you want a little more serenity, a villa on the outskirts will be the place for you. Spacious ones, with their own pool and amazing views, are idyllic. There is also a pretty big chance that buying property here in future will make an appearance on your bucket list. You have been warned! High up above the city, looking down like a grand and watchful guardian, are the Atlas Mountains. Book a private tour up to them, and then take a hike! The landscapes and vistas are breathtaking, and the views will be unforgettable. Don’t forget your walking shoes, hat and enough water for the high temperatures! While the Atlas Mountains are entirely natural, back in the heart of the city you’ll find Jardin Majorelle. This place is also known as the Yves St. Laurent Gardens. That is because this is the guy who designed, built and curated this place. He is the guy who you will owe your huge thanks and blessings to when you see it with your own eyes. The colors are so bold and beautiful, they may make any you’ve seen before pale in comparison. And the plants, trees, water and shrubs are special enough to draw you in for a peaceful couple of hours. A great holiday or vacation is usually all about balance. So, balance the mountains with the gardens. Balance a luxury riad with the bravery to try some delicious street food in one of the many market squares. And balance a relaxing morning by your pool with a frenetic afternoon at Jemaa El Fna. 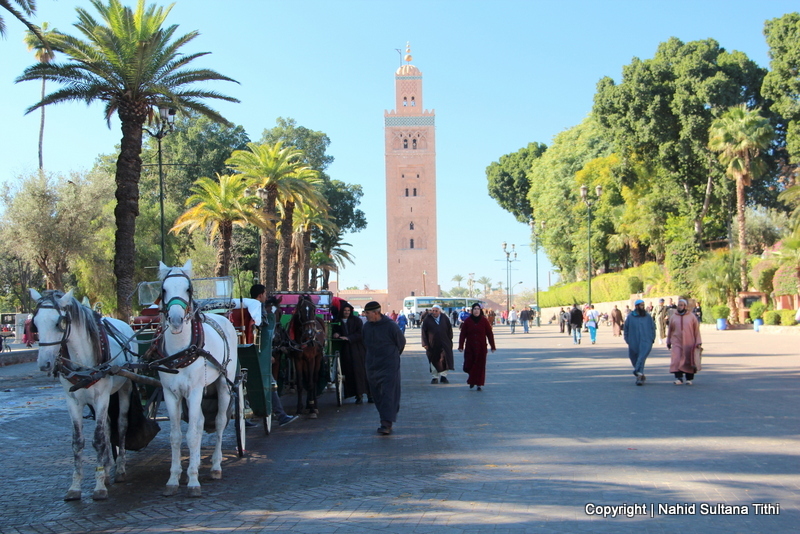 This is Marrakech’s biggest, busiest and most popular hub of shops, stalls, restaurants and cafes. Don’t be content with staying around the perimeter. Pack a bottle of water, some long clothing and dive right in. Go and get lost in the winding streets, and finding authentic wares from friendly, cheeky market sellers. CAIRO, EGYPT: I don’t think I need to say much about Cairo or Egypt as a whole. This is one of the earliest civilizations of the world and when you visit this country, you will know that some talented group of people lived here once few thousand years ago. Some of world’s very original art, culture, history, language, and science started from this land. For a traveler, this is a paradise to see, taste, learn, and experience uniqueness. Cairo is Egypt’s biggest city and is also known as the “City of Thousand Minarets” for having hundreds of big and small mosques in every corner. After being in so many places, I must say there are 2 places where I found people to be the friendliest, most helpful, and hospitable. One was in Dublin and another city is Cairo. 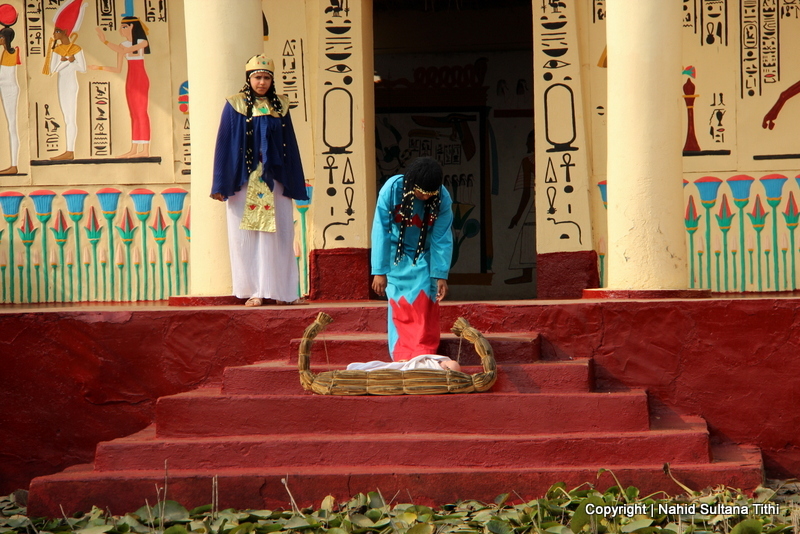 Egyptian people are always eager to help its guests and very humble. This is a contemporary and thriving city with glorious history from past…a perfect place to feel both of the worlds and eras. Some FYIs and tips for the travelers before visiting Cairo: Egypt made it really easy for US citizens to travel their country. We can get entry visa in the airport for 15 USD per person. About transportation, always ride white taxis with meters. Black cabs don’t have meters, therefore better to bargain a price before riding. Always carry tissue or napkins with you. Some public bathrooms don’t have tissues, even if they do they will expect some tips for that. 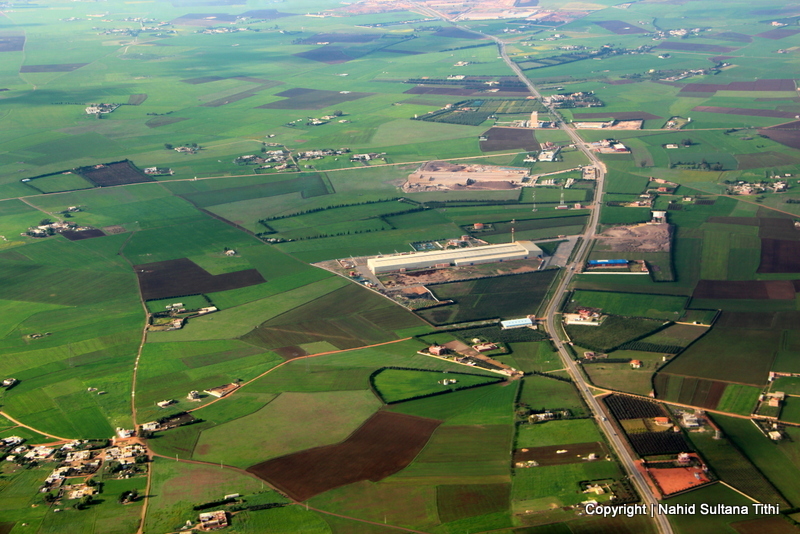 TIME of TRAVEL: We flew to Cairo from Belgium during the 2012 Christmas break. While it was freezing in Belgium, the weather in Cairo was just perfect. But carrying a sweater won’t be a bad idea when traveling here this time of the year. OUR HOTEL: We stayed in Cairo Moon Hotel in the heart of Cairo, only 10 minutes’ of walk from Cairo Museum and Tahrir square. Honestly speaking this was a below average hotel with tiny (for only 3 people) and scary elevators, big red ants walking all over the floor, too much noise late at night, and few other problems. But the owner of this hotel, Mohamed, is an exceptionally friendly and helpful gentleman. All the staffs here are same way too which overcomes all the other problems of this hotel. Mohamed organized few trip for us here and there including the trip to Giza. It had free basic breakfast and free Wi-Fi. Pick up from or to airport can be arranged if you let them know ahead of time. 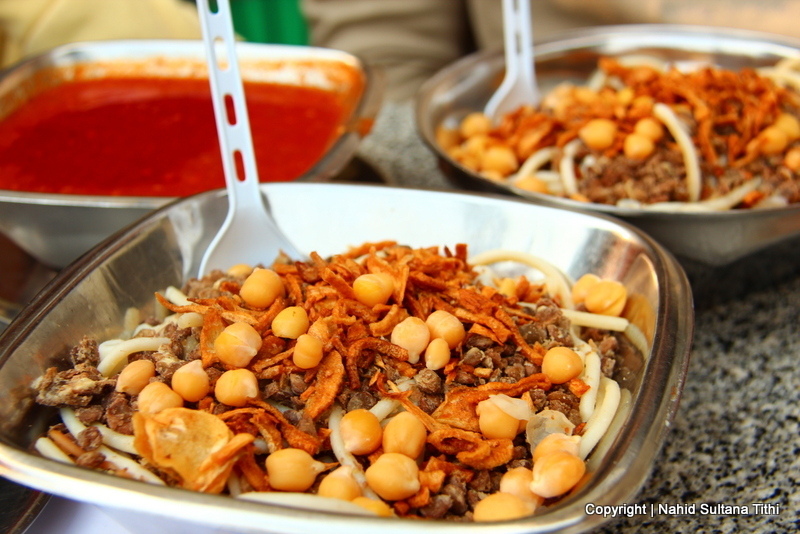 EATING and SHOPPING: Kushari is a famous cheap street-food in Egypt. This usually comes in different sizes. It may sound weird, but this combination of pasta, rice, spaghetti, lentils, white beans, and fried onions is very filling and tasty when you mix it with different types of sauces. We had dinner on 2 nights in a very popular restaurant in the heart of Cairo, called “Gad”. From the daily crowds of it, we could tell that this was going to be a great place to eat some local food. They have burgers and fast food menu as well as some traditional dishes, like Egyptian pancakes, spiced salad (the best), and burger with egg. One of the castle-like restaurants in Al-Azhar Park was a very fancy spot where we were taken to for a dinner by someone we knew. Night view of Ali Pasha Mosque in citadel as we were having dinner was gorgeous. I think this is where we had our best food in Cairo. Also try Egyptian pizza, falafel, and shwarma. I can give you a whole list of things that you can buy from Cairo. Spices, papyrus, sphinx, pyramids (in different colors and materials), shawls/scarves, traditional clothes are just to name some. Khan-El-Khalili is more of an expensive place for tourists. Most of the tourist attractions have small stores or vendors nearby. When we took our Giza trip, our guide Haisam took us to a big showroom of papyrus, Golden Eagle Papyrus on Sakkara Road. This is a government approved store, and therefore you know you are buying the real thing. It has hundreds of papyrus wall decors to choose from at various price ranges and with different themes. The guy who was showing us around actually took 10 minutes to show us how a piece of papyrus was made from its trees…that was absolutely fascinating and very educational for our little ones. Here is their phone number if you need it – +2037719585. 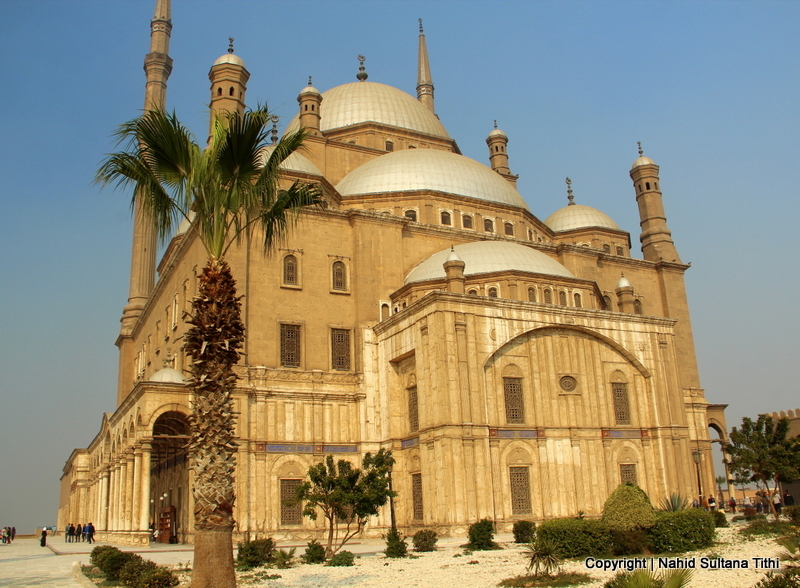 PLACES WE’VE VISITED: Cairo is overloaded with many touristic places from really ancient wonders to modern and stylish sites. We spent about a week here and was pretty much done seeing most of old part of the city. We could have stayed longer to visit experience more of new areas, its night life, and thriving life of Cairo. Other than the following some other places that tourists can consider visiting (we couldn’t see these places) are Cairo Tower, which can be seen almost from any corner of the city and provides 360-view of Cairo including Giza. Also dropped off your list was Abdeen Palace which was home of the last king of Egypt the exiled King Farouk. 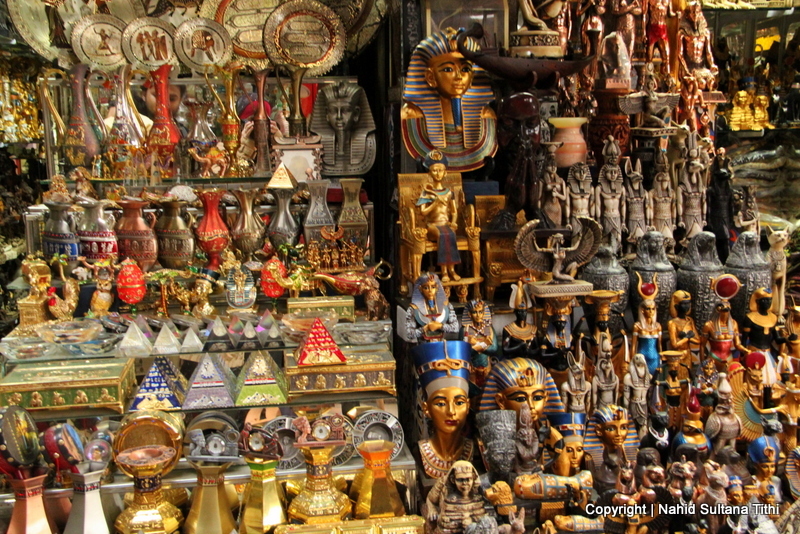 1) KHAN-EL-KHALILI BAZAR: Khan-El-Khalili Bazar is a tourist trap in Cairo for shopping. It’s a like big maze with winding small alleys and many small stores. You will find almost anything here including perfumes, spices, handcrafts, traditional clothes, gold, and many other things. I wouldn’t recommend buying papyrus paper from here as they may not be real Egyptian papyrus. But whatever you buy bargain is a must…not just here, in whole Cairo. 2) NILE RIVER CRUISE: You can’t leave Egypt without experiencing Nile at night and the best way to do is to take a dinner-cruise. Our ship’s name was Lady Diana Nile Cruise Line. This was a unique experience for all of us and the kids loved it the most. Combination of Nile and Cairo looked more than just beautiful at night from the observation deck. It was a cozy sitting area where we had dinner. Buffet trays were filled with absolutely fantastic food. The show started with karaoke songs during our meal but the real entertainment started after dinner. First it was belly dance, which we saw before…I think I enjoyed the fast Arabic music the most here. 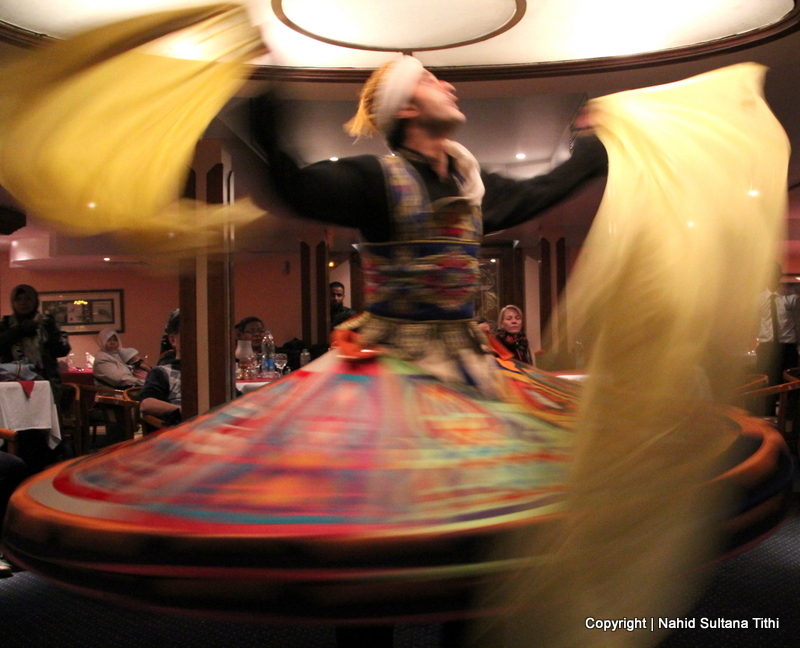 The final item was a man doing whirling Sufi performance. Now, that was something we have never seen before and it looked out of this world. The enthusiastic music, Dervish’s costume, his circling…everything about it made that place very mystical. Our hotel arranged this trip for us. It was 90 USD for all 4 of us. The dinner started at 7:30 pm and by the time we were done with all the performances, it was about 9:30 pm. 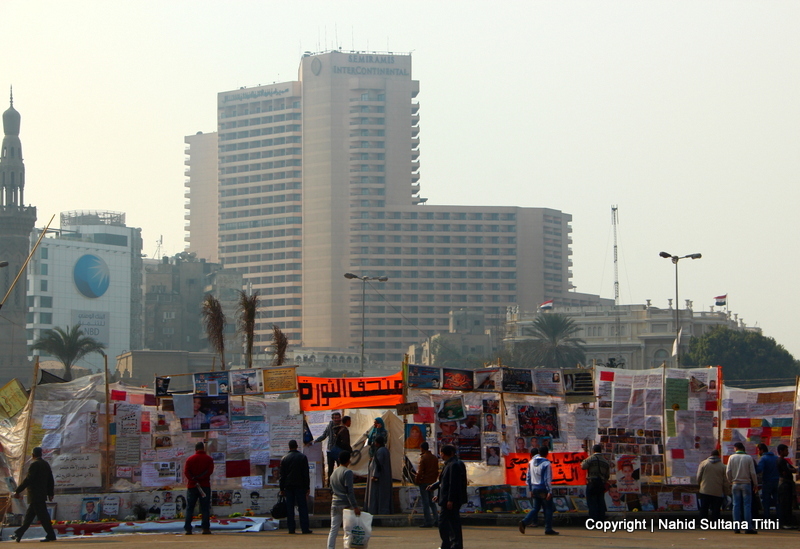 3) TAHRIR SQUARE: Also known as Midan Tahrir (meaning Liberation Square) is located in front of Egyptian Museum and was occupied by the demonstrators’ campsites and banners during our visit. This is where Egyptians gathered around during the uprising of the country before impeaching their President Hosni Mubarak. 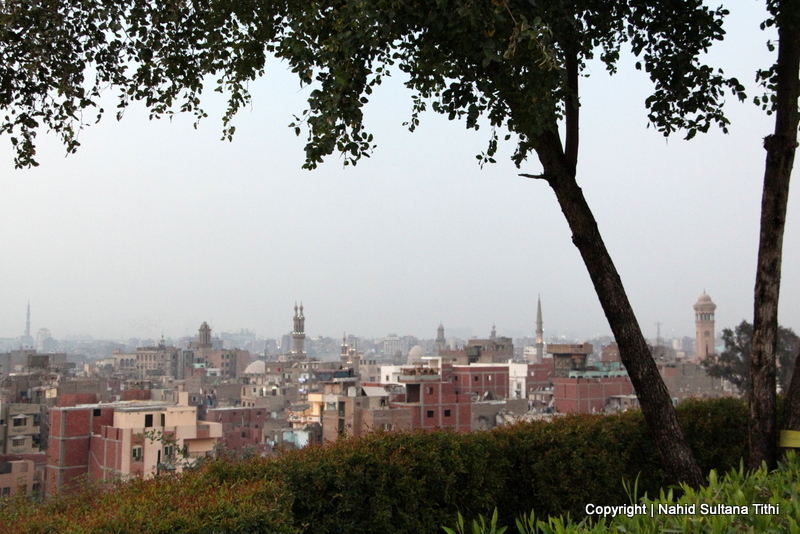 This large public square is a historic place for Cairo and Egypt and their history. 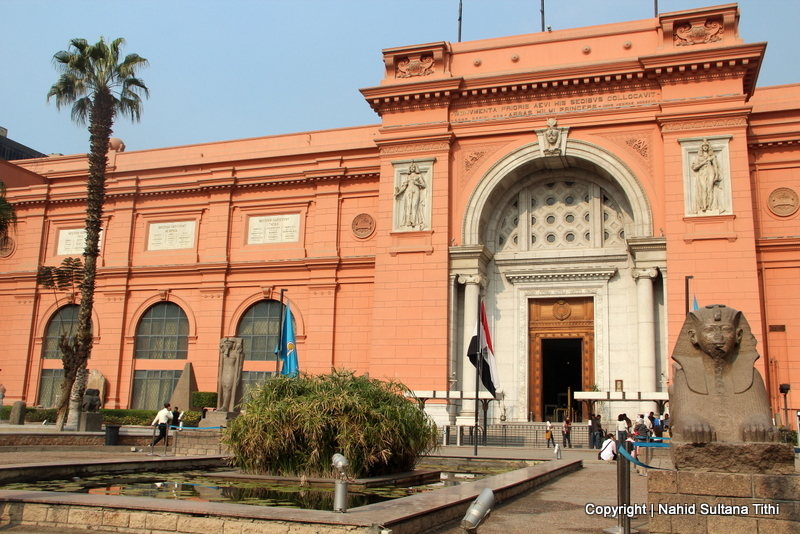 4) EGYPTIAN MUSEUM: Located in busy Tahrir Square, this is one of the greatest museums in the world and a must-see to acquire knowledge on real history of Egypt. Massive collections of ancient Egyptian antiquities can be found outside and inside of the building. I’ve heard that hundreds of items are added each year to this museum as more excavations and discoveries take place. More than 135,000 items of this museum display artifacts of pre-dynasty, Old-Kingdom, Middle-Kingdom, late periods, and from Greek and Roman periods. Some of the highlights of this place are the 2 Royal Mummy rooms, pet/animal mummies, early jewelries, hundreds of beautifully carved coffins, stone-carved statues, hieroglyphics granites, and early manuscripts from different dynasties of Pharaonic periods from as early as 3200 BC. Finally many objects/treasures from Tomb of Tutankhamen, including his famous original mask is at display here. Royal Mummy room has mummies of ancient Egyptian kings, queens, and high priests. Seeing mummy of Pharaoh Ramses II really gave me goose bumps. Evidently, he is the Pharaoh who chased Moses (Prophet Musa AS) across Red Sea and drowned with his army in the ocean. His mummy is the best preserved mummy there… when you look at his teeth and hair, those don’t look like few thousand years old. The museum is a bit un-organized and many of its objects lack labels or information board. Some collections looked like they were just stacked without care. But the good news is that, the location of this museum is supposed to move somewhere in Giza which will have more space to accommodate these object of bygone days. Ticket to enter the museum is 60 LE for adults and 30 LE for children. There is a separate fee to enter the section of Royal Mummies which you can purchase from the upper level. It’s 100 LE for adults and 60 for the kids. No camera or backpack is allowed inside the museum. We had to keep them in a locker near the ticket office. The museum has 2 levels and visiting it took us about 2 ½ hours. 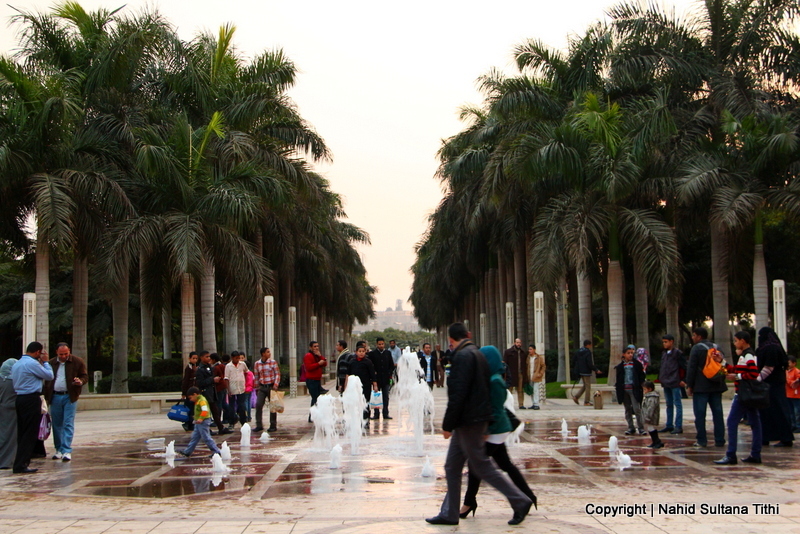 5) AL-AZHAR PARK: This is the best landscaped garden and park in Cairo for strolling and enjoying magnificent view of the city. It is known to the locals as the “lung of Cairo”. We went there right before sunset and saw the whole city lighting up as it was getting dark very slowly. Standing in Al-Azhar Park, you will realize why Cairo is known as “City of Thousand Minarets” … you can see many old and new minarets of mosques from here, creating a unique skyline. An uncle, my ex-colleague’s father, took us here and treated all of us to dinner in a restaurant inside the park name “The Citadel”. We had our best traditional Egyptian meal here while looking at lit-up Ali Pasha Mosque on the distance. The park looked ever nicer at night. 5 LE is the entry fee. It is very well maintained and absolutely safe. Park closes around 10pm and no one is allowed in afterwards. 6) CITADEL and ALI PASHA MOSQUE: Locals know this place as Salahdin’s Citadel because it was built by the mighty Salahdin (Muslim caliph who defeated the Crusaders) in 1183 AD. There are few old mosques and museums (like Police National Museum, Prison Museum, Al-Gawhara Palace Museum) inside the citadel. You can spend whole day roaming around and visiting them leisurely. The best part of being here is the view you get over Cairo. On a clear day, you can see as far as the Pyramids of Giza. Panoramic view of Sultan Hasan Mosque and Rifaii Mosque side by side looks great along with the other parts of Islamic Cairo. Ali Pasha Mosque, also known as Mohamed Ali Mosque, is an iconic structure of Egypt that can be spotted from almost anywhere in Cairo day or night. The mosque was built inside the Citadel in the mid-19th century. This old and grand mosque was established by Mohamed Ali Pasha, who is considered to be the founder of modern Egypt, and took about 18 years to build. From outside, the mosque looks more like the Blue Mosque of Istanbul. Courtyard is enormously spacious and beautiful. This big mosque is very beautiful inside with nice dome, vaulted ceiling, big chandelier, and old patterns on wall. 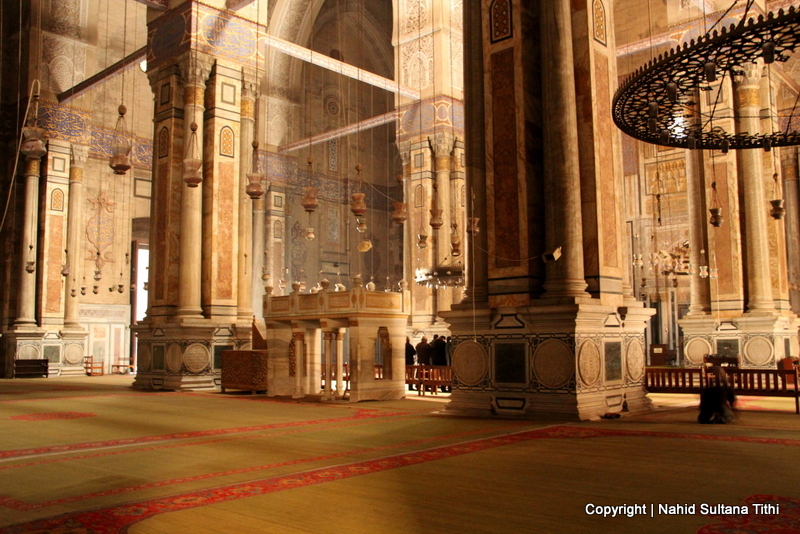 Tomb of Mohamed Ali Pasha is also located inside the mosque. One thing that made me sad about this mosque was that it lacked maintenance outside and inside. A structure this massive and historical is country’s pride and deserves love and attention which was missing from this place. 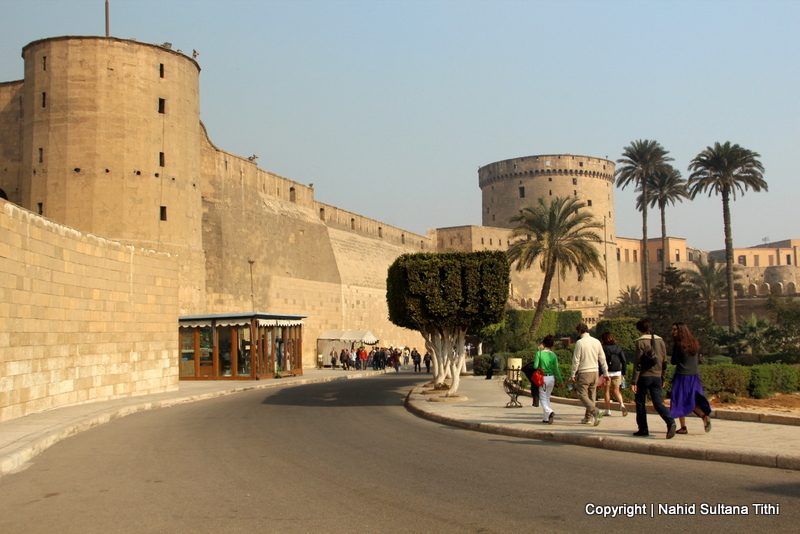 The citadel is located in Islamic Cairo. Entry fee to the citadel is 50 LE for adults and 25 LE for the kids and is open from 8 -5 pm. We didn’t go to any museums or mosques, other than Ali Pasha Mosque, that’s why we were done in few hours. 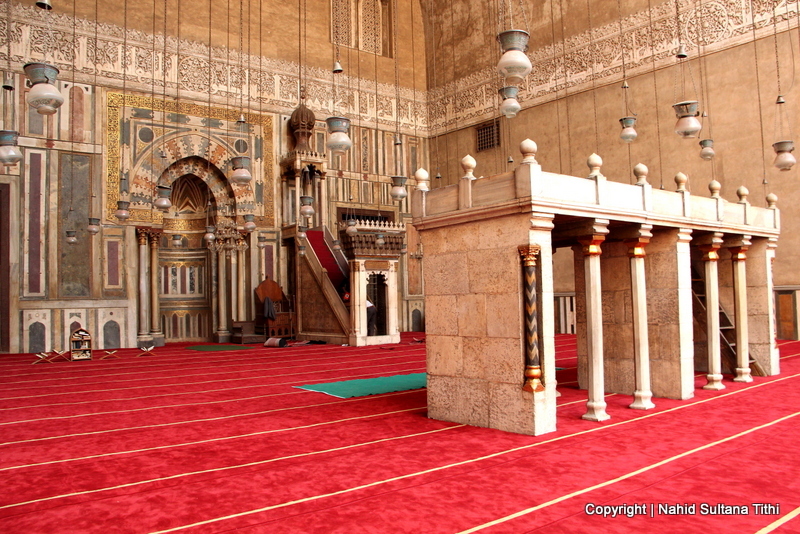 7) HISTORIC MOSQUES of CAIRO: Most of the mosques are located in Islamic Cairo and they are very old, dusty, and lack in maintenance. You will see many homeless and beggars lurking around these places. Please try to maintain right etiquettes of visiting these sacred places during your trip, it shows the local that you respect their culture and belief. 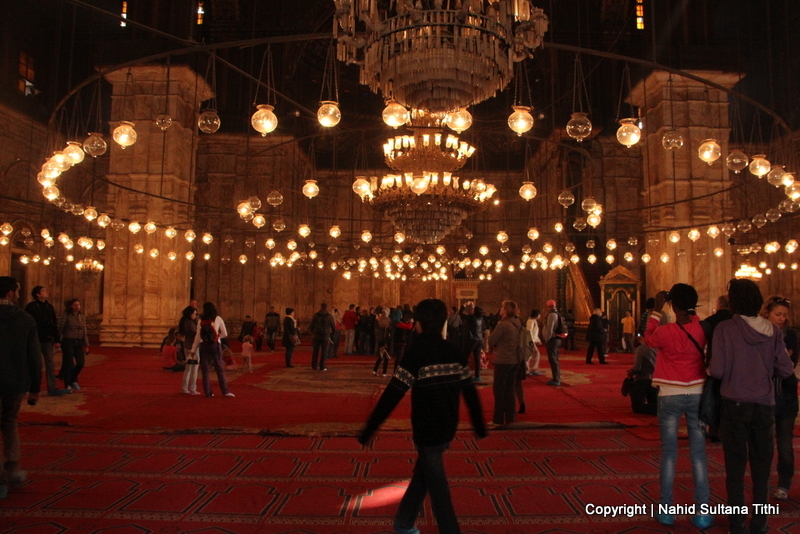 a) SAYYIDINA AL-HUSSEIN MOSQUE: The mosque is located in Midan Hussein and very close to Khan-El-Khalil souk. The original mosque was built-in the early 12th century. This is a very sacred site for Muslims all over the world since head of Ibn Al-Hussein, grandson of Prophet Muhammad (S.A.W), was buried here. 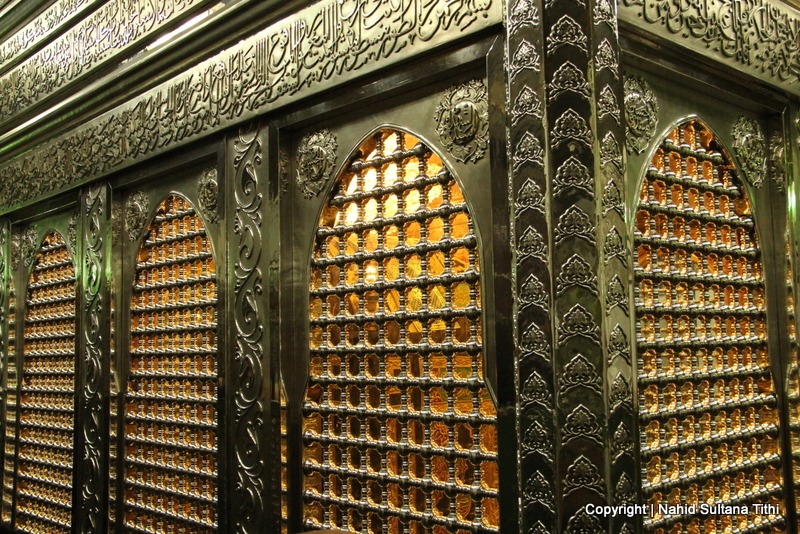 The decorative rawdah or tomb can be viewed from both men and women side. It’s free to enter (have to pay 1 LE to store your shoes) but unfortunately, this in not accessible to non-Muslims. 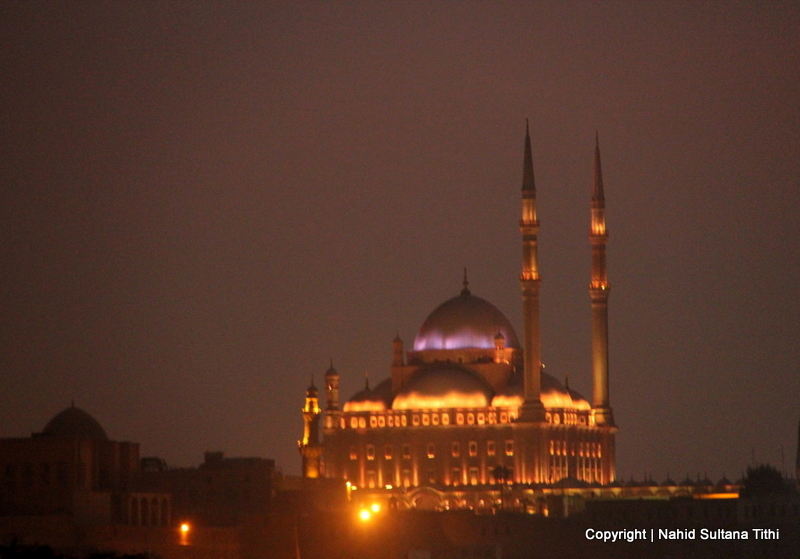 b) AL-AZHAR MOSQUE: This is another historic site in Midan Hussein. 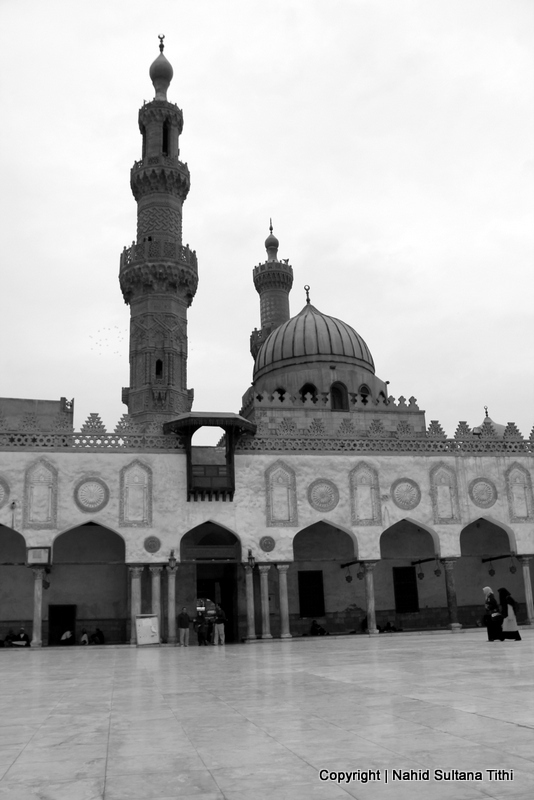 Founded in 970 A.D., Al-Azhar Mosque is one of Cairo’s oldest mosques and nearby Al-Azhar University which is the world’s OLDEST OPERATING UNIVERSITY. Its big and open inner courtyard is very peaceful where you can spend some time appreciating its age and beauty. Inside the mosque is simple but very big. It’s free to enter but have to pay 1 LE to store your shoes in the entrance. Non-Muslims can access this mosque but not during prayer times. 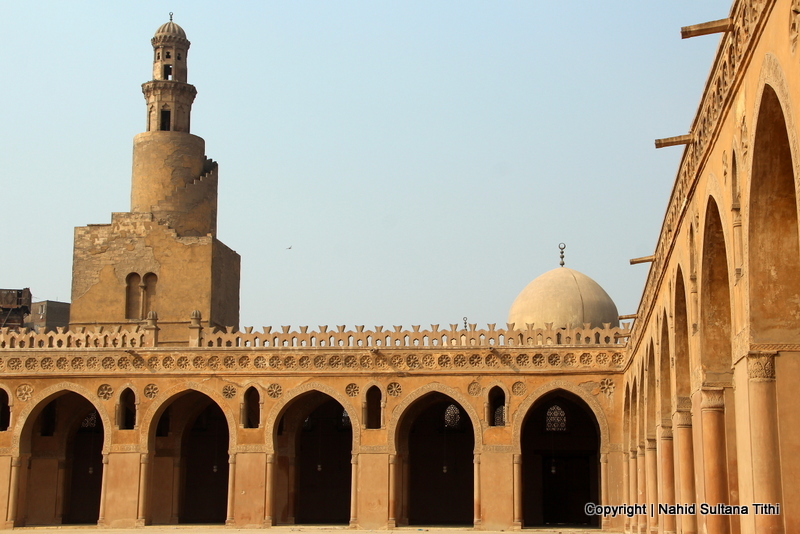 c) IBN-TULUN MOSQUE: Built in 879, this mosque is from early Islamic era. The minaret of Ibn-Tulun Mosque is said to be the oldest minaret in Egypt. The inner courtyard and the interior are huge, but lack care. It was free to enter and took us about 15-20 minutes to walk around the perimeter. The mosque is still active, therefore, they don’t allow any visitors during prayer times. d) SULTANA HASAN MOSQUE: Located in Midan Salah ad-Din (Saladin Square) and lying at the foothill of the hill, this is a really old mosque from 1356 and is a great example of Mamluk dynasty. 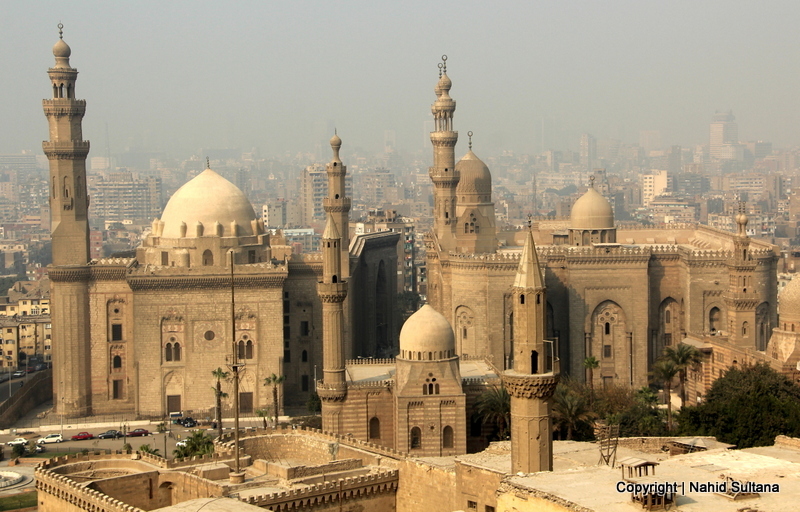 This is one of the biggest mosques in Egypt. This is actually a both mosque and madrassa (Islamic school) with very early Islamic architectural design. You can still see some of the original old mosaic floors here and there. The courtyard is notable for its elaborate marble flooring, a trademark of Mamluk art. It was under major renovation during our visit, therefore couldn’t visit some of the sections. Entry free to this mosque and Rifaii Mosque is 40 LE for adults and 20 LE for kids. e)RIFAII MOSQUE: This mosque is located right opposite of Sultan Hasan Mosque and the same ticket covers both the mosques. This is probably the last large-scale mosque to be built-in pre-Republican Egypt. Several leading architects of that time took part in designing it. Replacing a smaller mosque, this early 20th century mosque is the final resting place of the last Shah of Iran (Mohammad Reza Shah Pahlavi). Many members of the Egyptian royal family were eventually buried in the mosque. 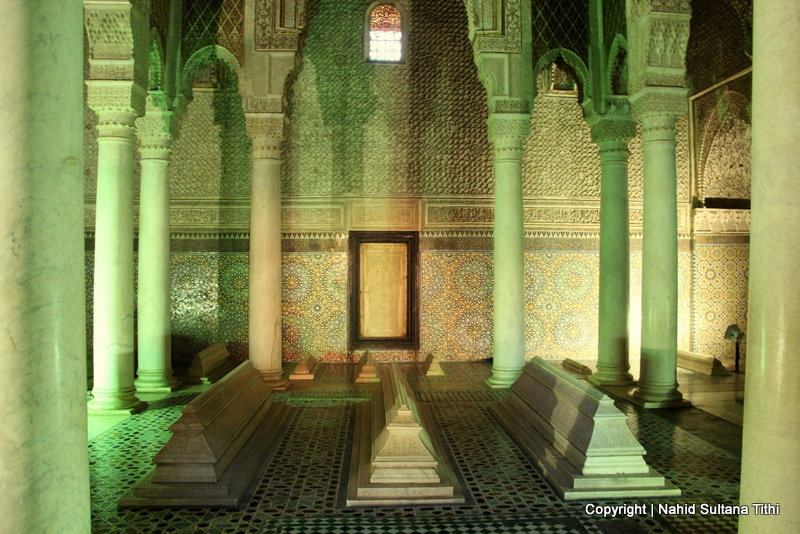 Ironically, Egypt’s King Farouk, who was overthrown in 1952 and died in exile, has his tomb inside the mosque too. Both exterior and the interior of the building are elaborately decorated. High ceilings and big old chandelier are some of the highlights of this place. 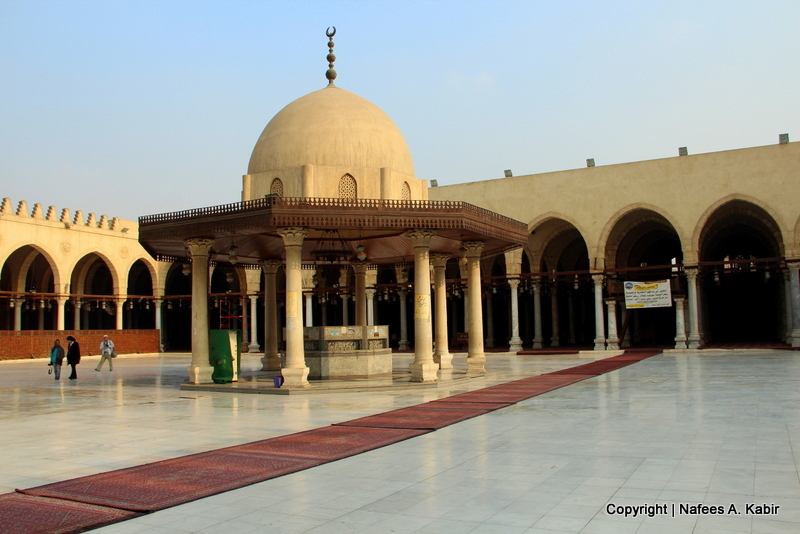 f) AMR IBN AL-AS MOSQUE: Built in 642, this is Cairo’s first mosque and is still an active place for the worshippers. The mosque looked very simple, dull, and not very nurtured by the authority. The mosque is free to enter for everyone, except during prayer times. Men and women have separate entrances. The ladies have to wear a cloak and everyone must take off their shoes upon entering any of mosques. 8) COPTIC CAIRO & ITS CHURCHES: This is part of Old Cairo and has been home of Cairo’s Christian community for centuries. You can actually walk from Amr Ibn Al-As Mosque to the boundary of Coptic Cairo. 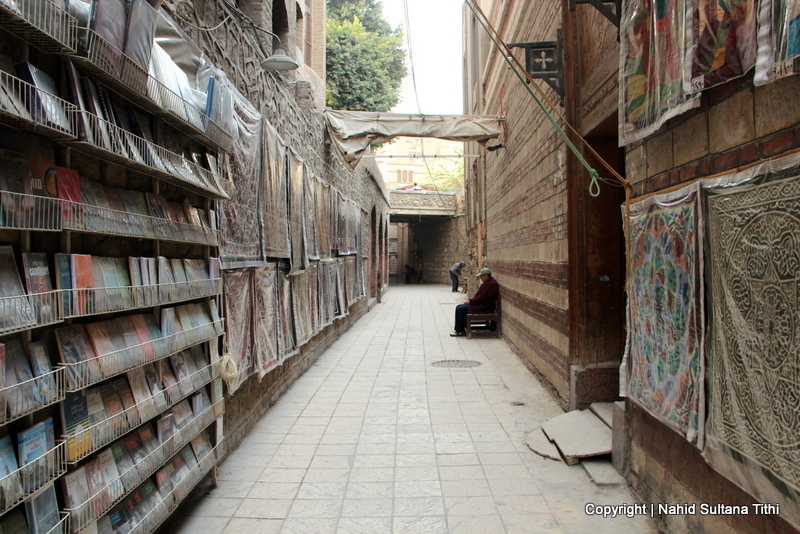 Old walls and the winding alleys of Coptic Cairo are amazing. Many old churches and monasteries still stand bold and beautiful here. One of the biggest and oldest churches (from the 7th century) of this community is The Hanging Church. It was under major renovation that time, so we couldn’t get an inside view. Then we followed an old road of this neighborhood and stopped at in front of another underground ancient church, called Church of St. Sergius. Built in the 4th century, this church has been destroyed and renovated many times over and over again. This old style church is very small but beautiful inside. When we entered there was some kind of recitation going on inside the church and I must say it was a bit surprising listening to these recitation in Arabic, it sounded like I am in a mosque…lolz. Another interesting fact about the Christians here is that they celebrate Christmas on January 7th of each year and not on 25th of December. We took 3rd package but for the lack of their organization and time management, we couldn’t visit all four museums. It’s better to come here in the morning and stay until they close. The “Village Tour” is done by a small engine boat that takes you to the “Mythological Canal” and gives you a ride thru the canal for 30 minutes. This was probably the best part for all of us. You actually see real people enacting ancient scenes of agriculture (like fishing, farming, and etc.) and ancient industries (like papyrus, cotton, wine, pottery, mummification, and a lot more). As the little boat passes by each station you feel like you are living in that era of ancient time. After our boat stopped at the last stop, we met up with a young man who guided us thru the exact replica of Karnak Temple of Luxor. Even though not the real one, this architecture and its decoration are almost look-alike of the real temple. Leaving the temple behind, he showed us around the example of how rich men and peasants used to live thousands of years ago…model of their houses, real people acting out how fire was made, how rich man’s wife would live a lavish life, and how a poor man’s wife would have to work hard all day at home. After a 10 minutes break, we headed towards “The Tomb of Tutankhamun”. This is another depiction of the actual tomb of Egypt’s most famous Pharaoh, King Tutankhamun found in Valley of the Kings in Luxor. You can visualize the exact way the tomb was discovered by Howard Carter in 1922. The tomb was filled with many treasures, furniture, couple layers of casket layers, mummified body of King Tutankhamun, and finally his musk, an iconic symbol of ancient Egypt. 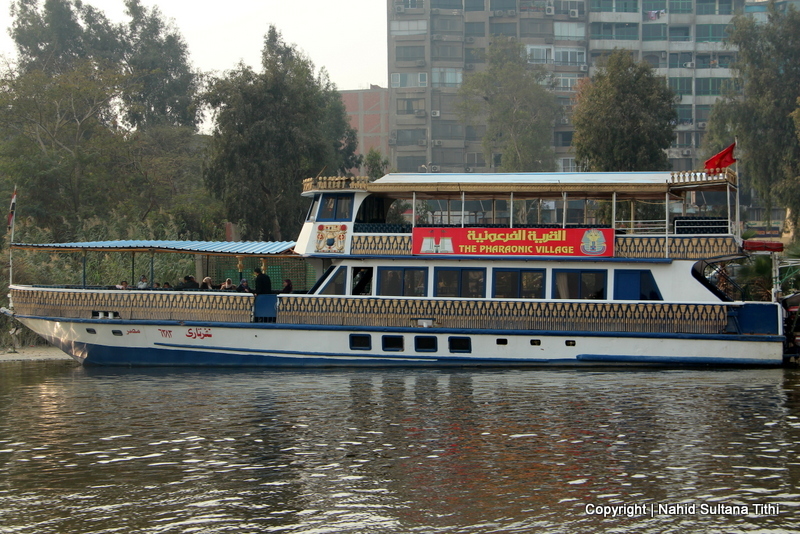 Our last attraction was Nefertari Yacht tour. 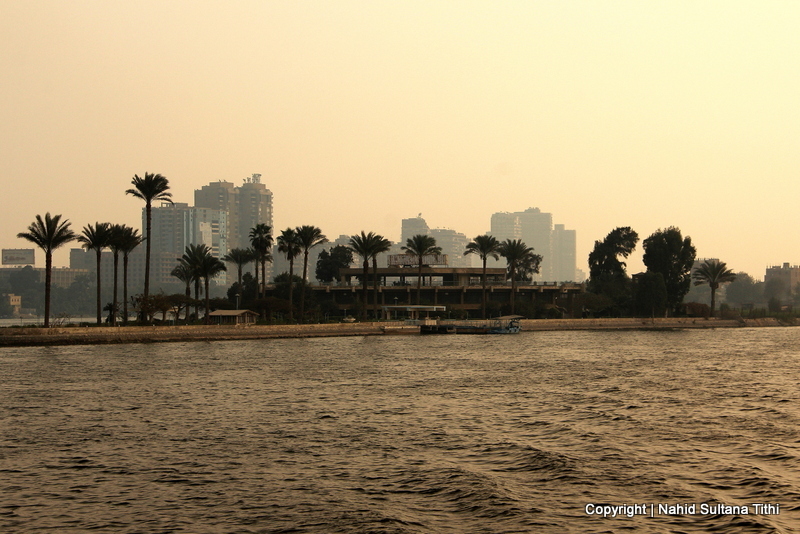 The yacht took us to River Nile and gave us a chance to get a daytime view of the river for 45 minutes. 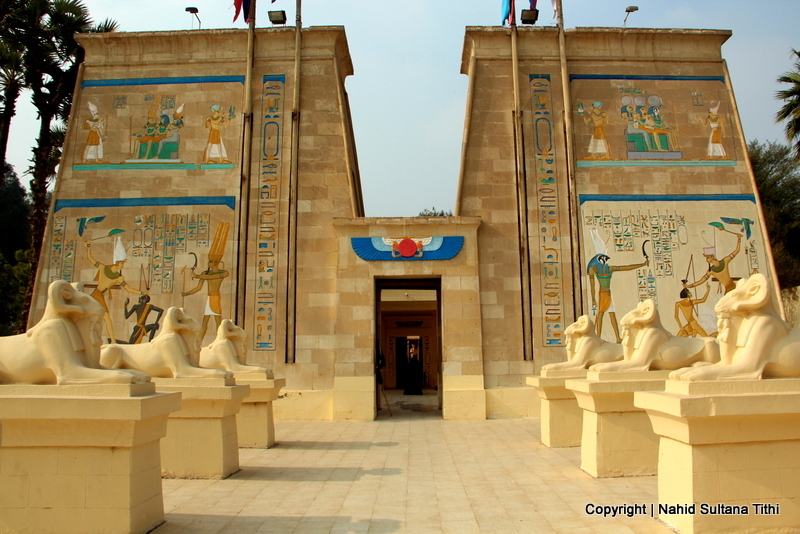 The park has few important museums, like Pyramid’s Museum, Cleopatra’s Museum, The Tomb of Tutankhamun, Mummification Museum, Boats Museum, Modern History Museum, Museum of Islamic History and Art, and couple other museums. Each of these museum doesn’t take more than 15-20 minutes but they are very informative. There are also few unique souvenir stores, cafes, and a photo studio. MARRAKECH, MOROCCO: Marrakech is one of the major destinations not only in Morocco but in whole Africa for its location and unique landscape. Situated near the foothills of snow-capped Atlas Mountains and very close to Sahara desert, Marrakech is a city with magic in every corner. We didn’t really spend time in the new part of the town. 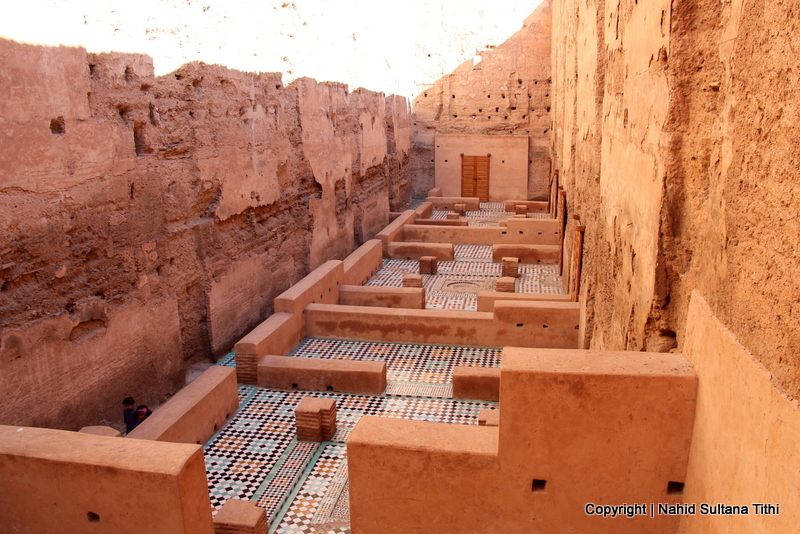 All the tourist attractions were mostly located in the historical district, known as Medina. The locals here speak very well English along with Arabic and French. Moroccans are very friendly and helpful. 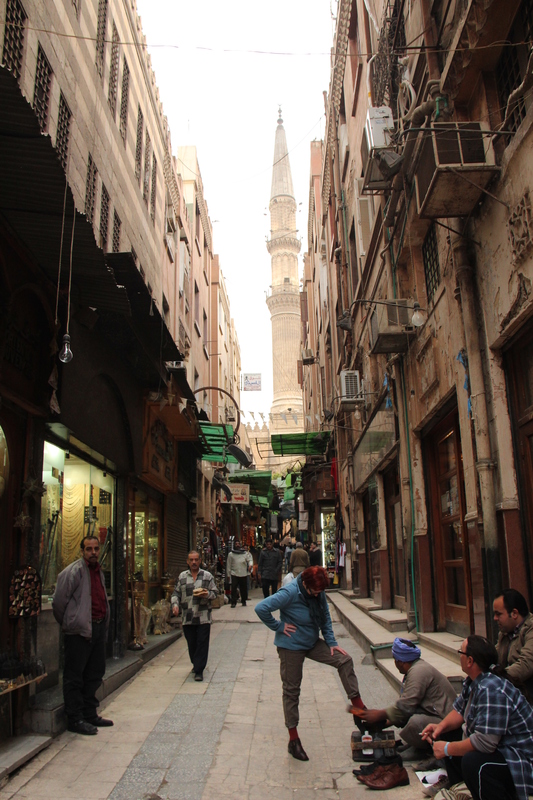 Walking around Medina on foot is the best way to experience the city and its culture. Just be careful when crossing roads as too many bikes, motorcycles, donkeys, and horses sometimes make it a bit harder to walk in the main roads. 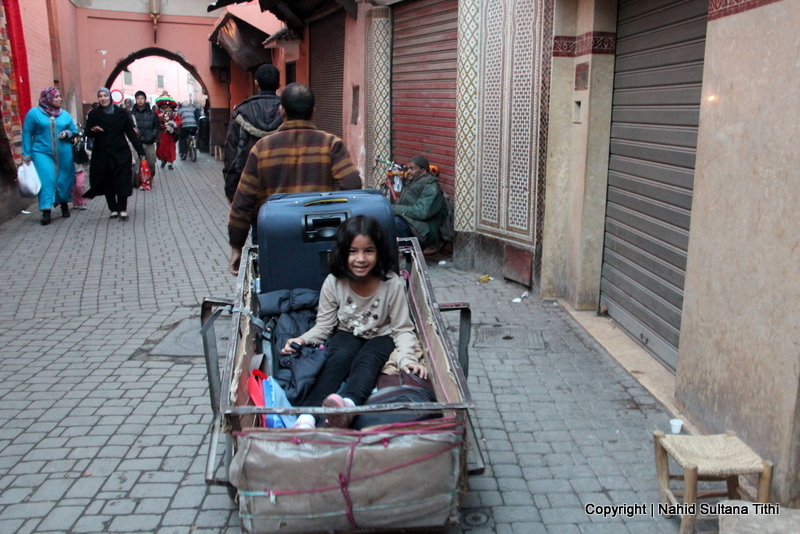 TIME of TRAVEL: We flew to Marrakech on the first week of January 2013 during my daughter’s winter break. It can be very cold in Marrakech around this time of the year. Some days were really pleasant but got a bit chilly after dark. 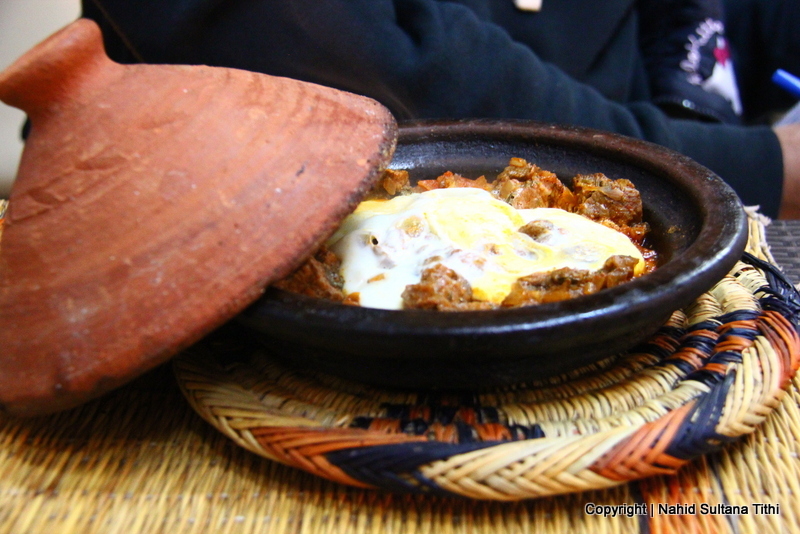 EATING and SHOPPING: You can get wide variety of dishes inside the old walls of Medina. There are few permanent restaurants in one side of Djemaa El-Fna, where we had our first dinner. The place was called “Taj’in Darna”, we sat on the 2nd floor with a whole nightly picture of Djemaa El-Fna from the window. Dried fruit juice and avocado juice were something we never tried before and had to taste it. We also had beef kebab taj’in with eggs that night. “Café Arabe Marrakech” is another place we went for a lunch which is very upscale and luxurious multi-level restaurant with a terrace, courtyard, and inside sitting options. I didn’t see any locals here; mostly westerners come here for drinks, to chill, or to have exquisite meals from professional chefs. This was by far the best place we’ve dined in Marrakech. Café Arabe has menus offering traditional Moroccan dishes as well as Italian dishes. I tried harira soup, which combines vegetables, rice, lentils, chick-peas, and lamb in aromatic spices. Another evening, we ate in the open food-court in the middle of Djemaa El-Fna. You won’t see these restaurant during day time. They start setting their restaurants up every day before evening and there are too many of them to choose from. I won’t highly recommend eating here if you are looking for some good food. We had some tasteless kebabs with fries and salad that night and I never wanted to go back there again. 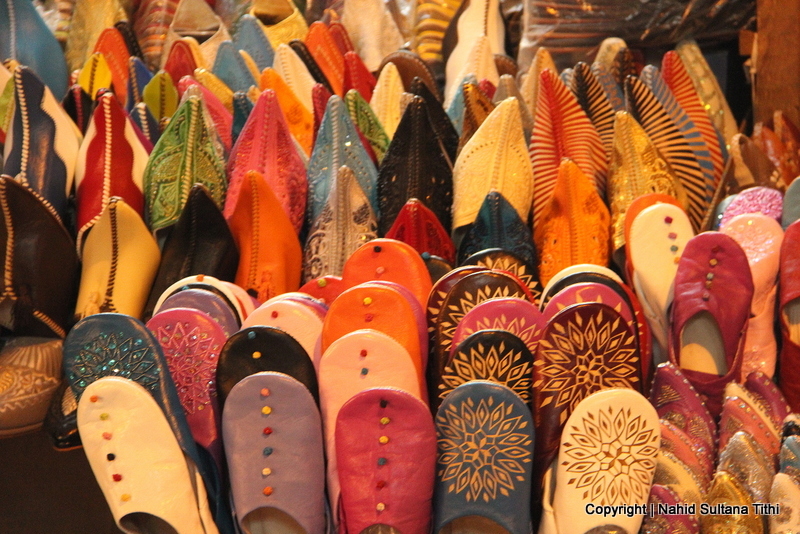 For shopping, I literally went crazy while roaming around the souks in Marrakech. I wish I had more space in our suitcase during this trip. You can seriously empty your pocket buying many unique souvenirs from here. I ended up buying different sizes of tagines (traditional clay pottery for cooking and serving), a Moroccan style hanging candle-holder, tea set, silver tray, small folding table for serving tea, babouche (Moroccan slippers), and saffron. I still wanted to buy a painting, a silver tea-pot, scarves, more spices, rugs, mirror, colorful serving platters, and bowls. We saw many vendors in and around Djemaa El-Fna who were selling dry fruits like dates, figs, raisins, and other things. Don’t forget to drink freshly squeezed orange juice from here. 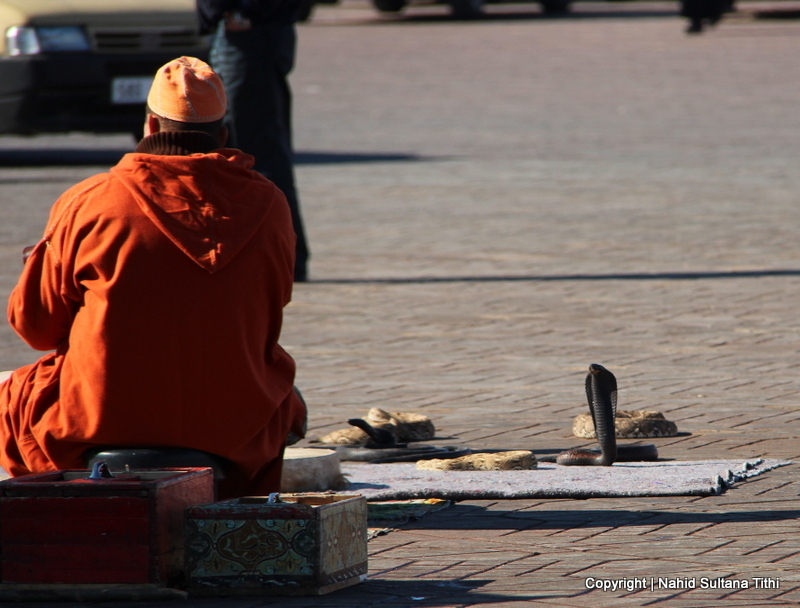 You have to bargain while shopping in Djemaa El-Fna or other nearby souks. Start bargaining from one-third of whatever the price the salesman tells you. You can find pirated CDs for cheaper price here too. You can use credit/debit cards pretty much in any of the shops but I won’t recommend it for fraud and extra fees. There are many exchange booths near Djemaa El-Fna who will give you good rate for your currency. 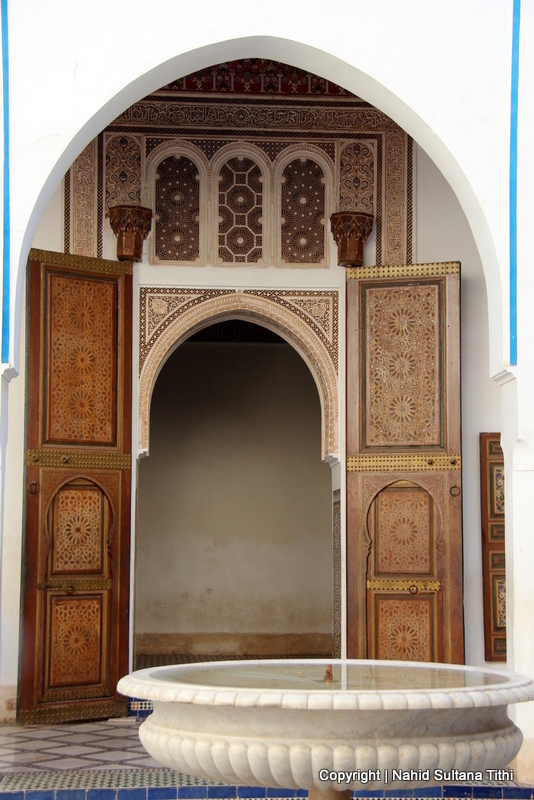 PLACES WE’VE VISITED: All the places we’ve visited in Marrakech were inside the old walls of historic district, Medina. It’s hard to picture the hustling-bustling and enchanting life inside Medina from the other side of the wall. 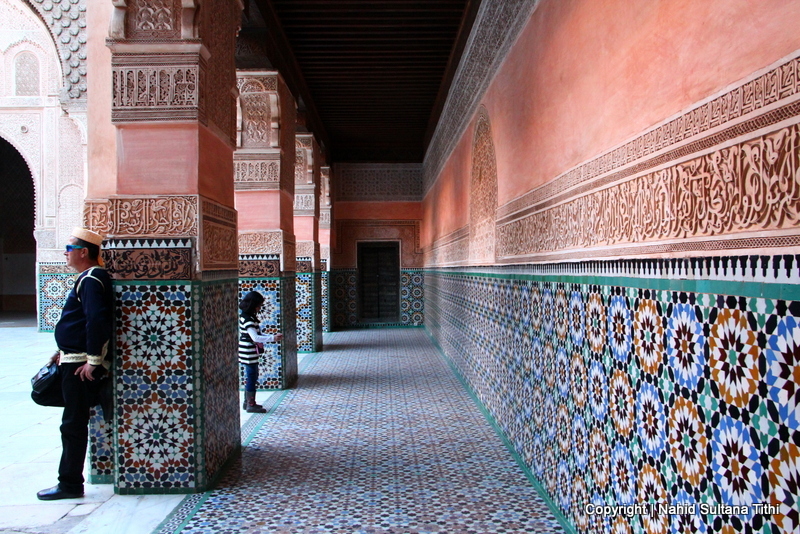 The fun is to get lost in the mazes of this old part of Marrakech and navigate thru the exotic alleys without any map. Other than the places below, visiting tanneries, museums, and some gardens may be good choices if you can spare some time. Royal Palace is also located very close to Djemaa El-Fna but cannot be accessed since the royal family still resides there. In Marrakech we spent 3 full days and it was perfect. Doesn’t matter how long you stay here, dip into the magical life inside Medina and enjoy every bit of its character to the fullest. 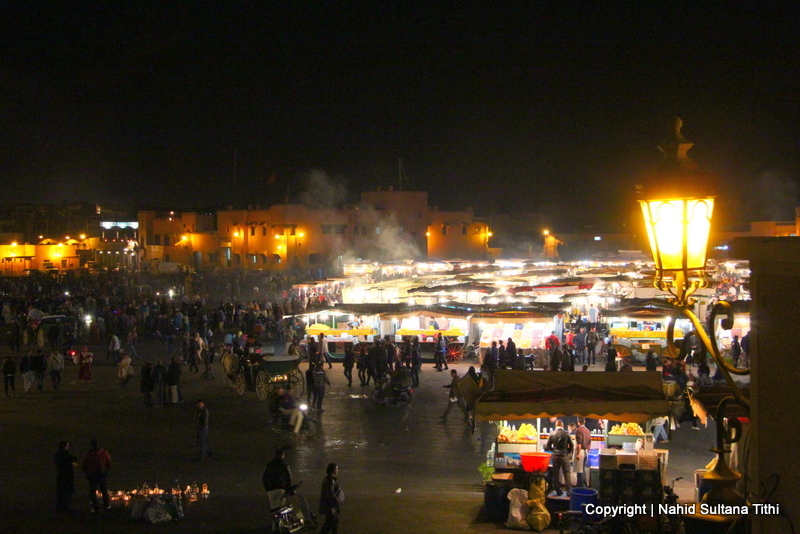 1) DJEMAA EL-FNA: This is the beating heart of Marrakech and the place to get a vivid picture of this enchanting city. If you have only couple hours to spend in Marrakech, Djemaa El-Fna would be the spot where you would want to stay absorbing its unique atmosphere. This is the biggest and main square surrounded by many restaurants and shops. During day, the place is packed with many snake-charmers, people with monkeys, women to design henna on tourists, horse-wagons, and smaller vendors selling trinkets. At night, it’s a totally different picture and is the best time to enjoy Djemaa El-Fna. Hypnotic music and loud drum beats fill this place with excitement. Musicians, dancers, and actors/actresses keep this party alive until late at night. Enjoy different kinds of dishes that the open-air restaurants offer in the middle of the square; after that may be a glass of freshly squeezed orange juice. This is the best place to see, hear, and taste Marrakech to the fullest; this place is all about enjoying life and the moments…so enjoy every second. Just to give you some ideas of the prices on different services in Djemaa El-Fna, I must say some shows, like musicians/dancers usually don’t demand any fix amount while snake-charmers or monkey performers may want a specific amount. It’s always better to agree on the price before anything. Horse-riding for 45 minutes charged us 75 DH and henna tattoo on both of our daughters (on one hand each) was for 50 DH total. Whatever you do, don’t let bargaining ruin your fun…really not worth it. 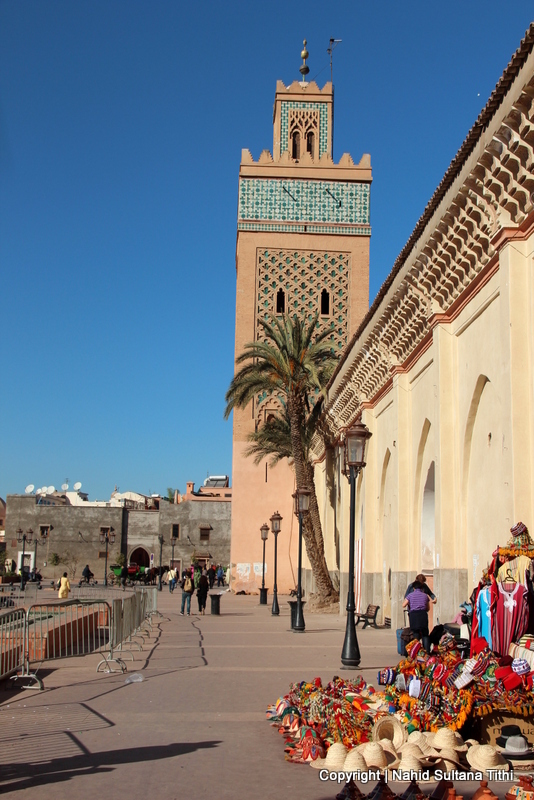 2) KOUTOUBIA MOSQUE: The mosque was completed in the late 12th century and the exterior is made from brick and sandstone. This is known as the “Eiffel Tower” of Marrakech and its tall tower can be seen from many parts of the city and from Djemaa El-Fna. It doesn’t take more than couple minutes of walk to reach there from Djemaa El-Fna by passing the rows of rental horse-carriages. Unfortunately, the mosque is not open to tourists. Muslims are allowed inside only during prayer time. Since we couldn’t go in, we decided to just walk around the perimeter of the mosque passing some old ruin and gardens. 3) EL-BAHIA PALACE: Located within walking distance from Djemaa El-Fna and El-Badi Palace, El-Bahia Palace is really an awesome attraction and a must-see in Marrakech. This gives a good impression of what it was like to be a nobleman in the 19th century in Morocco. The ornate rooms, long passageways, tranquil gardens housing many lovely plants, calm courtyards with fountains can keep its guests entertained for couple hours. Enjoy the original tile works on the fire-places, doors, windows, and lots and lots of stray cats outside the building. The palace charges 10 DH per person (free for kids under 12). Be careful of the tour guides inside the palace; they usually pick random people and start telling history, then charges a lot of fees for showing you around. If you want a guide, better to bargain and set the price beforehand. 4) EL-BADI PALACE: The unique Badi Palace was a royal palace constructed by the most famous king of Saadien dynasty, Sultana Ahmed Al Mansour Addahbi in 1578. The general plan of this palace was inspired by Alhambra Palace of Granada. The palace is now in ruins and home of many storks and stray cats. Couple of the rooms still have the original exquisite mosaics and tiles. 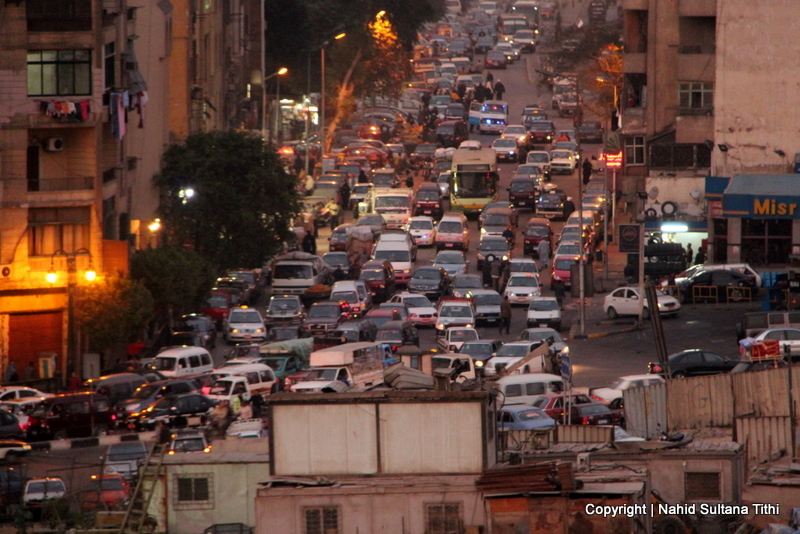 It took us good 15-20 minutes of walk from Djemaa El-Fna, passing some busy and congested streets. It’s open from 9 am – 4.45 pm and entry fee is 10 Moroccan DH (free for kids under 12). We spent about 45 minutes in this palace enjoying its rooms and gardens leisurely. 5) SAAADIAN TOMBS: This is a very well-preserved graveyard from the time of Saadien around late 16th century. This is the home of many tombs from different religions and background. The fantastic wood and stone carved doors are totally jaw-dropping. Inside the main building, you can take a peek at the room with few important tombs decorated with overloaded Moroccan tiles. The garden is a nice place to walk around and enjoy different colors of roses, tall palm trees, and many other pretty plants. Entrance fee is only 10 DH (free for kids under 12) and you can easily spend a good hour enjoying its garden and the tombs. 6) BEN YOUSEF MADRASA: This madrassa (Islamic school) is one of the largest madrassa in the North Africa and has been standing here since mid-16th century. Located in Medina, this is another great example of early Islamic art and architecture. We saw the small rooms where little children and may be teachers lived once. The center and the main courtyard is intriguingly marvelous and is decorated with mosaic floor, tiled fountain, and calligraphic walls…the beautiful carvings of them are something beyond my limited words can describe. The madrassa is open from 9 am – 6 pm. Ticket to enter is 50 DH per person (free for kids under 12) only for madrassa and 60 DH for the madrassa and museum. 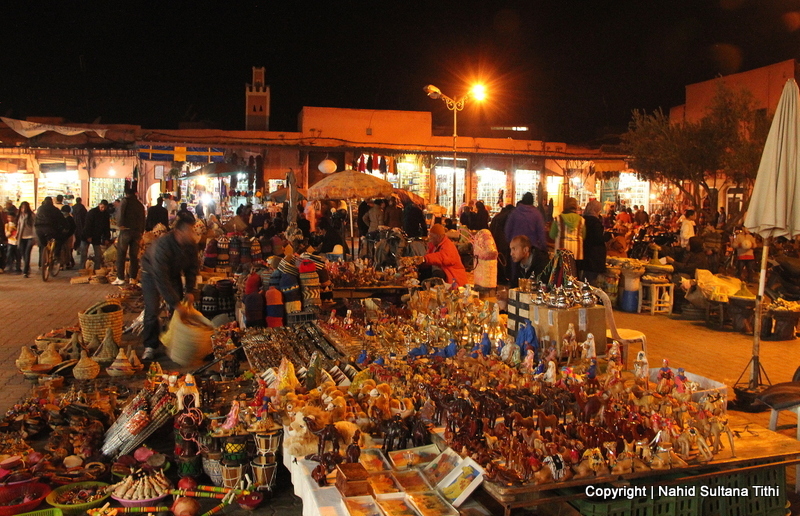 7) SOUKS: Souks or the markets are the best place to enjoy the real essence of Marrakech. 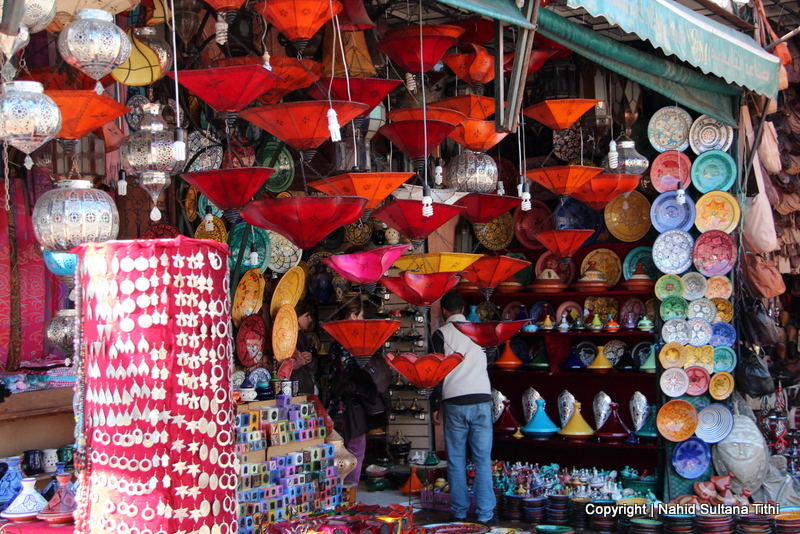 Located just beside Djemaa El-Fna, these souks sell almost anything including tagines, lamps, spices, babouche, tea sets, tea-pots, Islamic clothing, home decorations, shawls or scarves, and many other things that you won’t find anywhere else in the world. Of course, you end up paying more for being a non-Moroccan. Nevertheless, do what the locals do and don’t forget to look around and bargain before committing to buying. You can have a whole day dedicated just exploring the little alleys of these souks and looking for the best bargain. 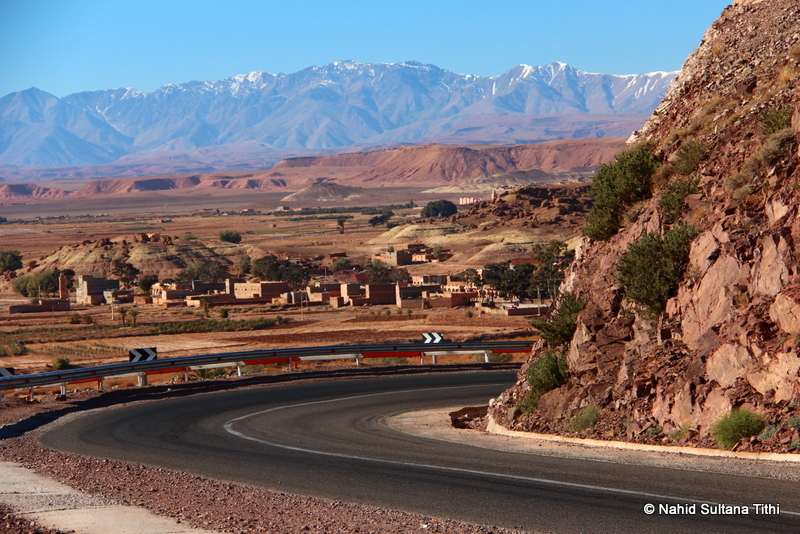 8) DAY-TRIP to OUARZAZATE: Ouarzazate is about 200 km south of Marrakech. This was a nice way to get out from the city life and visit not only the natural beauty of this country but also the life-style of local Berbers. We needed some fresh air after being in Djemaa El-Fna, Marrakech for few days and this was just a great escape to the wilderness. We paid 1200 Moroccan Dh for the whole arrangement which included a tour-guide who was also a driver. 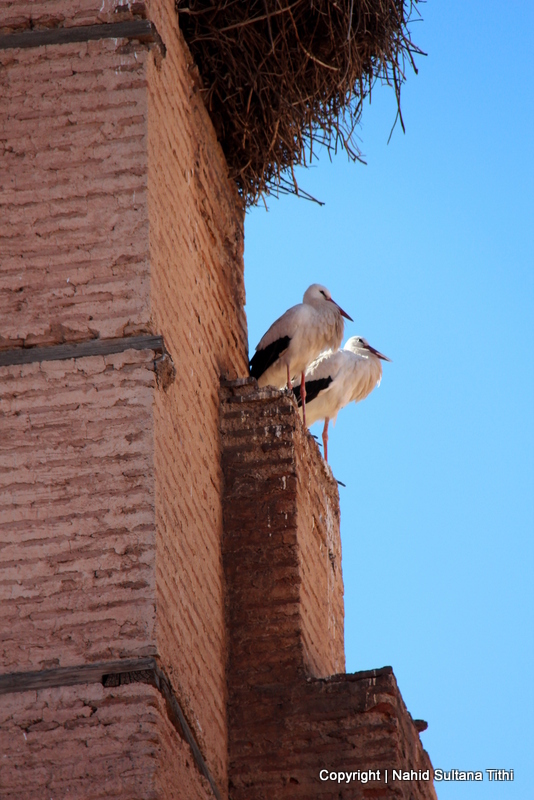 Please visit my page on Ouarzazate on the right-side bar for all the information on the city. There were many other day-tours we could’ve chosen (e.g., Ourika Valley) which were available through our riad (hotel where we stayed).